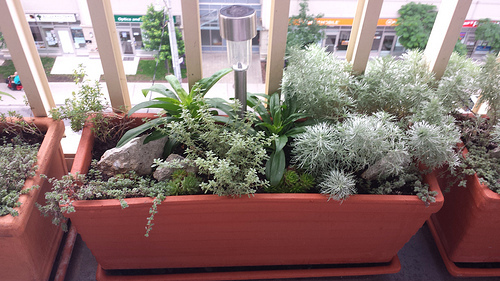 The plant in pictures is Artemisia schmidtiana. Commonly known as ‘Silver Mound’, It is grown for its interesting foliage. 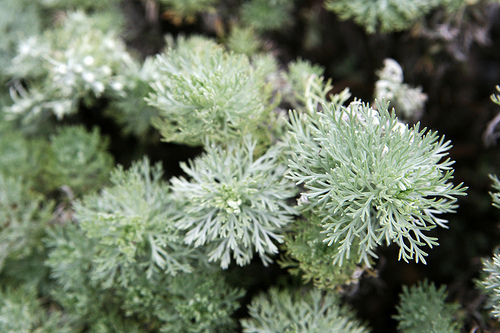 Artemisia schmidtiana grows as a low-growing perennial that forms symmetrical mound of feathery and silver-green leaves – making it an excellent choice for pots, borders, and a filler plant for flower beds. It can also be combined with other annuals and perennials in the garden. Though the plant produces small ball-like flowers of yellow color in summer, the flowers usually remain unnoticed. It is the delicate, fern-like foliage that gives this plant its ornamental value. The plant can be grown easily from stem cuttings or by dividing the rootball. It requires sunny exposure and survives in almost any soil type. It also requires moderate watering and thrives in a well-drained soil. It can also withstand spells of droughts easily.